Carol Robertson, Head of Community Fundraising at Brain Tumour Research, has completed a 400-mile cycle ride in just four days in memory of her friend who lost his life to a brain tumour. 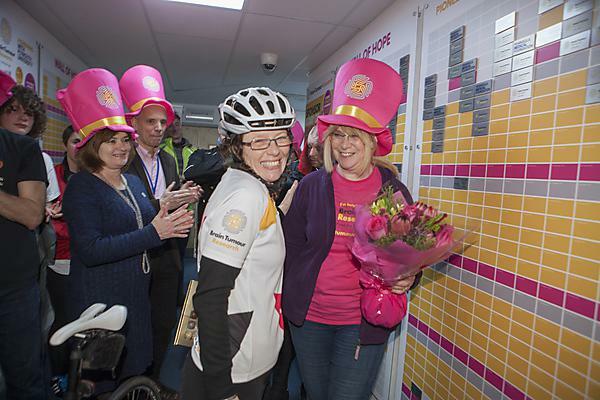 The cycle ride, dubbed the “Tour de Labs”, saw Carol start from the charity’s HQ in Buckingham and visit each of the four Centres of Excellence funded by Brain Tumour Research – two in London, at Imperial College and Queen Mary University London – before heading south for the universities of Portsmouth and finishing at the labs at Plymouth University Peninsula Schools of Medicine and Dentistry. Carol Robertson calls herself the “old bird on a bike”, and has been joined by supporters along the way. On the last leg from Dartmoor Zoo she was joined by owner Ben Mee (a Brain Tumour Research ambassador) and his colleagues, researchers from Plymouth University and members of the Yogi cycle club. Carol’s aim is to raise over £40,000 in memory of her friend Ian Meek to support the national charity Brain Tumour Research. The amount will ‘buy’ four days of research at each Centre of Excellence. Her arrival in Plymouth kicks off a series of events to mark Brain Tumour Awareness Month. It is not too late to make a donation, and to do so please visit Carol's Tour de Lab's fundraising page.